Common Hawthorn fruit (Crataegus monogyna) ripe for picking. 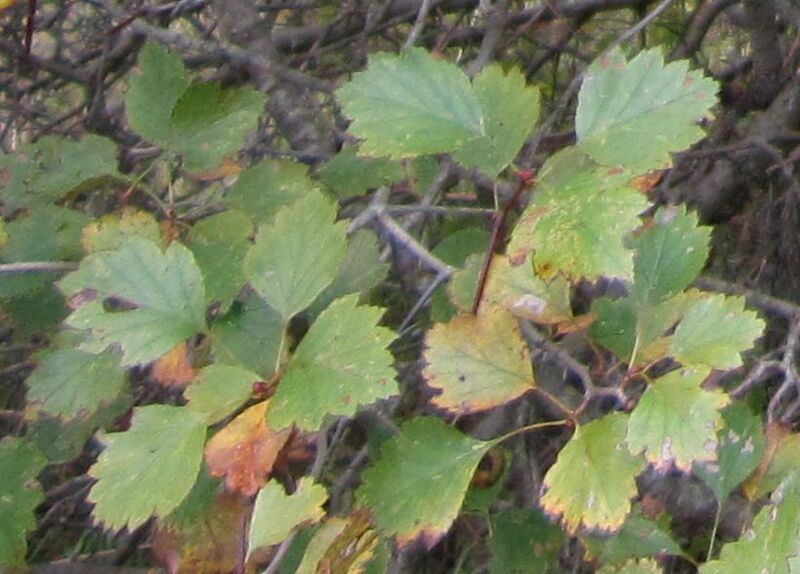 Note the leaf shape for the Common Hawthorn. NOTE: If you are not interested in growing Hawthorn trees, but just finding the berries and using them, try going to the Nature's Restaurant Online site for Hawthorn Berries. 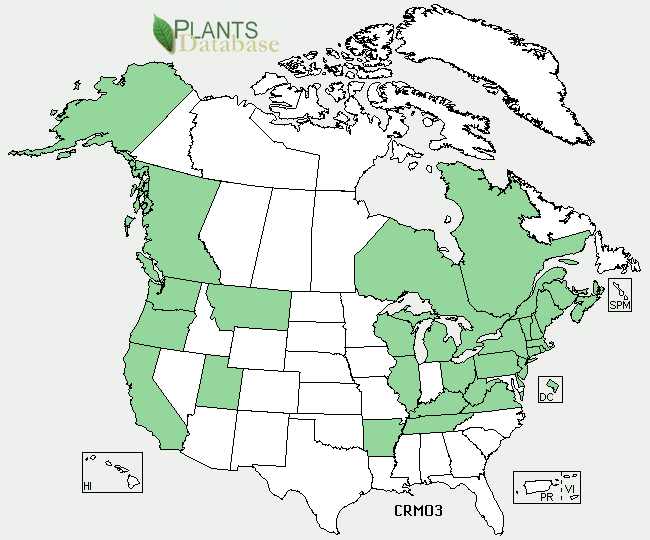 Since Nature's Restaurant Online is about finding plant/trees/mushrooms in the wild, there are the most common types you will find in Eastern North America listed with pictures and descriptions. Hawthorn Berries (Hawberries) and Mayhaw (Crataegus). There are a lot of different Hawthorns in North America. Worldwide, there are hundreds of them. 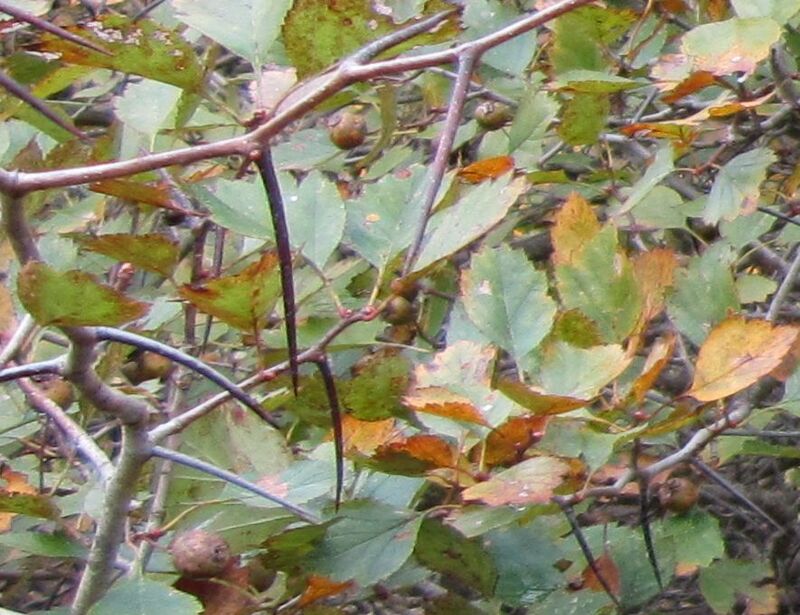 Many of the Hawthorns you find here are naturalized Hawthorns that came from other parts of the world. 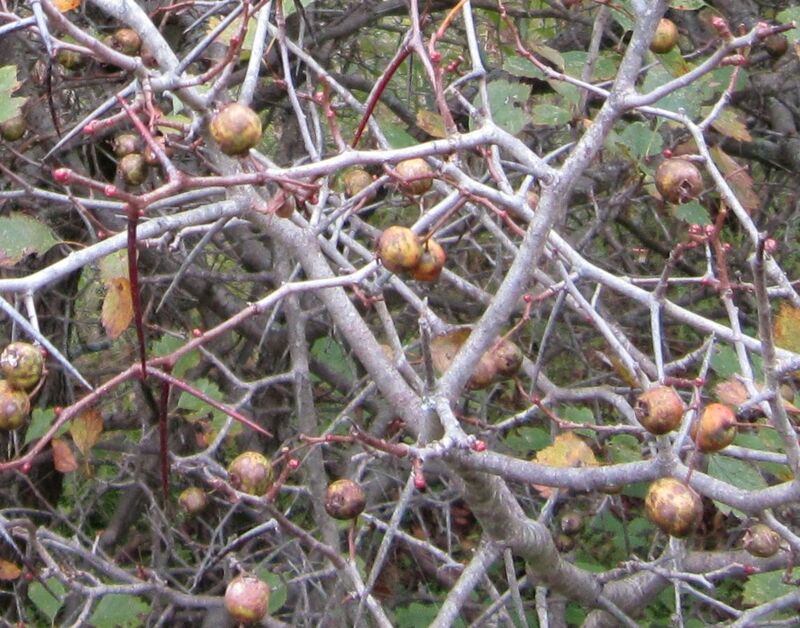 Hawthorns are from the same family as Apples and Roses, so it is no big surprise that the easiest way to describe a Hawthorn in general is that it looks like a smaller Apple tree with big thorns and fruit that looks like Rose hips or Crabapples. Be careful, the bigger of the woody thorns can be very dangerous - they are hard, sharp and strong and will go through flesh with ease. There is also a serious danger from the fruit of this tree - THE SEEDS ARE VERY POISONOUS. Never eat a seed - you have to take this seriously. It is often used as a security hedge to prevent people and animals from passing, as it forms dense, thorny hedges. And, since it can spread via the roots and send up suckers all around where it is planted, it just keeps getting denser as the hedge ages. Hawthorn has been used a long time medicinally for heart conditions. It is now believed that Hawthorn can act as a Beta Blocker similar to Beta Blocker prescription medicines. Because of this, you should be careful about eating Hawthorn berries if you are on such a medicine, as the combined effect might be too strong. A link here for starting further research on this subject. I've also read that it now has been shown to be a heart strengthener, and you do see Hawthorn being sold in the vitamins section of drug stores and health food stores as a cardiac tonic. 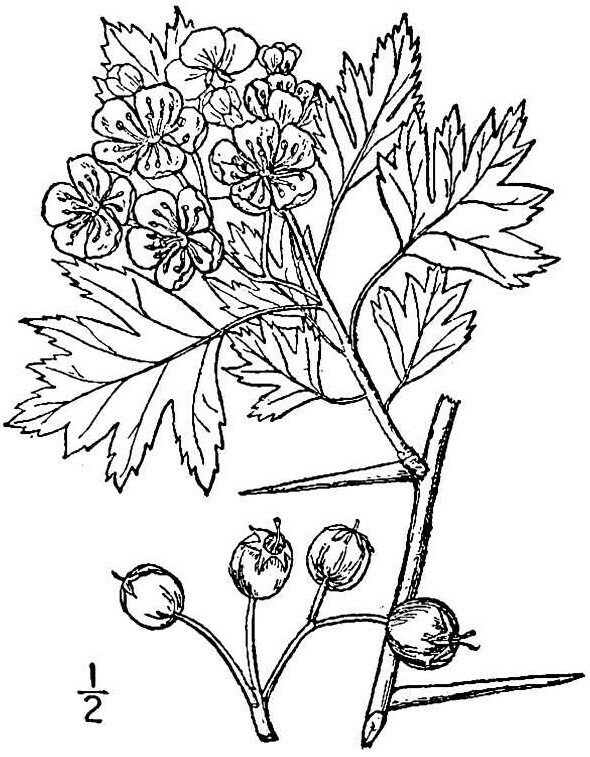 As I understand from my reading, it is the Common Hawthorn (Crataegus monogyna) that is used for that purpose. 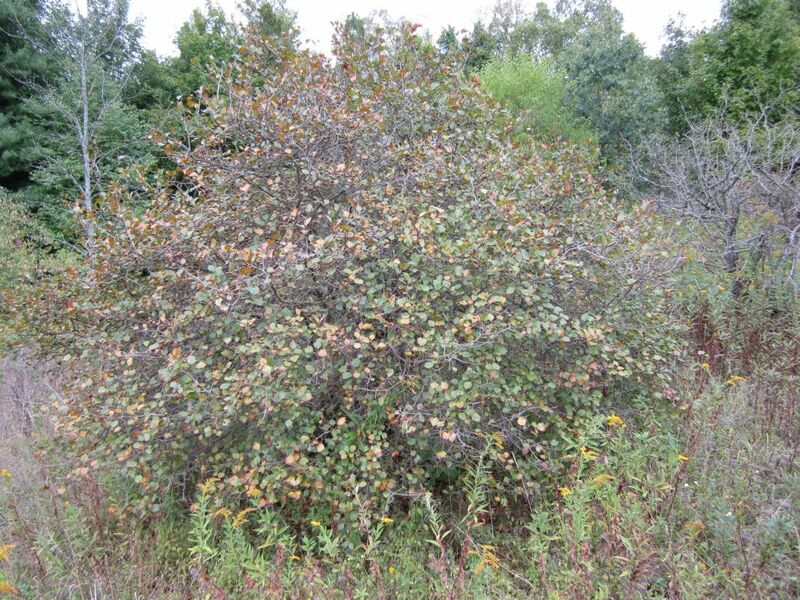 Whether or not the other Hawthorns you will find in Eastern North America have the same medicinal properties is something I cannot confirm or deny from my research. Since there are so many types of Hawthorn you can find in the wild, the question for the home gardener is which one. If you are growing for food, and find one in the wild you like the taste of, I can't see any reason not to use that type. If you are growing for the medicinal properties mentioned above, I think the prudent choice is to only use the Common Hawthorn (Crataegus monogyna). It is very common as the name would suggest. If you are particular about growing native species, be aware this in an introduced species from Europe and not native to North America. There are a huge range of native ones, and my best advice is to choose what is already growing well in your area. This way you are assured it is happy in your local climate and soil types. Transplanting: If you want to grow one, you are best to transplant a small one you see in an abandoned field, or if available at a nursery, get one there - though I doubt it except possibly for the Common Hawthorn. If you find one that is old enough to produce fruit, there is almost always little ones around, and besides they do send up suckers around it from the roots. If you transplant a sucker when it is young and in the early spring or late fall when the tree is dormant, you shouldn't have trouble getting it to take as long as you get enough of the root system. Seeds: You can grow them from seed, but it does take patience. You have to dry out a Hawthorn berry with the fruit inside until it is very dry, then put in a freezer for months. Probably best to take it out and thaw it out for a couple of days a few times and put back in the freezer. Then plant. Even after all this, they take a long time to sprout. This is surprising when you consider how fast they seem to take over abandoned fields. Cuttings: I've read conflicting reports whether they take well from cuttings, but I've not tried. My guess here is that it can be done, but requires specially controlled conditions and a lot of skill in cloning. Soil & Site: If you do decide to grow one of these, when choosing a spot, take into account the thorns can be dangerous to people and pets. 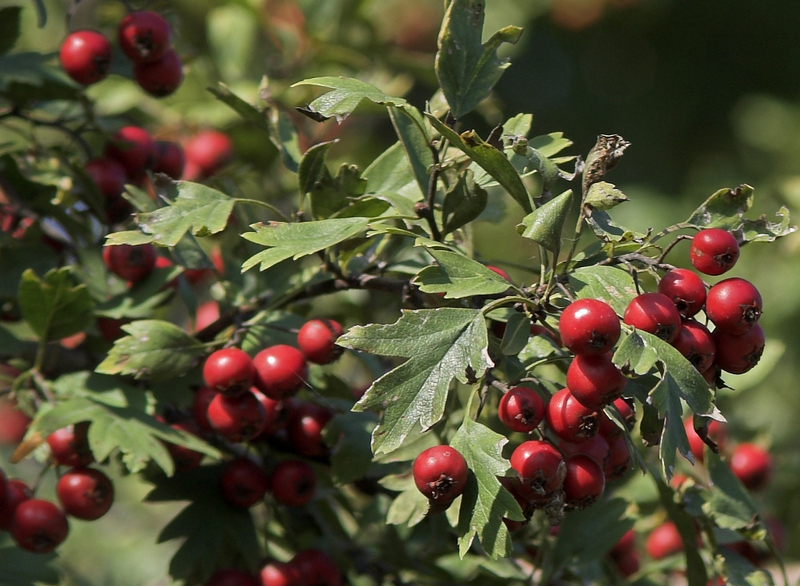 Read the habitats for the one you want to plant, but if you are growing the most commonly one grown for the fruit for food and medicine - the Common Hawthorn (Crataegus monogyna), it can adapt to most soils, likes full sun, and soil pH that is from very slightly acidic to slightly alkaline. This is one tree that seems to like clay soils. Maintenance: As far as maintenance goes, you can prune it to shape. Read the Apple section for more on pruning. The other issue is related to the suckers they send up from the roots. If you are growing a hedge, those suckers will fill the gaps. For along the hedge row and around individual Hawthorns, just mow. Grow grass where you don't want them, and by mowing, the root sucker issue is a non-issue. Regarding those nasty thorns, prune them off as soon as they appear with a pair of wire cutters or pruners. Using: I don't know the edibility of the fruit from the majority of the trees in the Hawthorn Genus. The three trees that form the group known as the Mayhaws do not even grow in my area, so my knowledge of them is limited to what I have read. Most of my familiarity is with the Common Hawthorn, but even then, I don't really try to distinguish between the different Hawthorns from an eating perspective. As far as I'm aware, none of the Hawthorns have fruit that is poisonous (except for the seeds which are very poisonous), but I cannot say if they all are good for eating. Do research on any you find, and experiment with small amounts and see if you like them. I have never encountered a Hawthorn with fruit that was really good tasting, but they are edible, and if cooked right, not bad in small amounts. Even in the past, they have more or less been a food you eat when other crops do poorly, not a first choice food. As far as cooking with the Common Hawthorn (and I'm guessing most others), you do need to cook it and strain out the very poisonous seeds once they have cooked down - the poison will stay in the seeds when cooking. You could eat them fresh, but there is little there, as the stone (single seed in the Common Hawthorn) takes up a good portion of each Hawberry, and besides, the taste is dull - and - some people report getting stomach aches from eating them raw. I don't, but I only eat two or three raw at a time, and maybe it takes more. Due to the medicinal effect mentioned above, I also suggest only eating small amounts of cooked or fresh Hawthorns at a time. Basically, after gathering a bunch of them, rub off the ends and stems by rubbing them between your hands, rinse, put in a pot, just cover with water, put in about half as much cider vinegar as water (some people say just use the cider vinegar and no water), and simmer for about 20 minutes until the Hawberries are soft, pour away the water/vinegar, mash up the Hawberries, sieve out all the seeds by pushing the mash through a sieve to capture the seeds, add some lemon juice and a touch of salt, (some sweetener can be used). At this point, if you know how to preserve in jars, you can do that, whereas I just put some in baggies, and freeze, take out one at a time, and use with meals. Personally, I like it as something different to use a little of with mashed potatoes. You could of course, use them to make a jam or jelly. I don't have a sweet tooth, so never bother with that. Since they have little flavor on their own, you could use them just for their pectin content and make jellies and jams for other fruit, and the Hawthorn berries will make them set. By the way, they start to lose their pectin once they get beyond ripe, so use when just ripe. Recipe search on the web here (Google search) and here (Bing search). Don't forget - THE SEEDS ARE VERY POISONOUS. Identification: There are some links below to help you identify a particular Hawthorn you know of. You need to realize, each species itself can be quite variable, and identifying which one you have can be a difficult undertaking. Most have red fruit, but there are also black and yellow fruited Hawthorns. If you do find a black or yellow fruited Hawthorn, start first with the list of the color you have, then check with the BONAP map to see if it grows where you live. This can at least cut down the number of possibilities. Starting off with the fruit color and the leaf shape helps narrow it down faster. 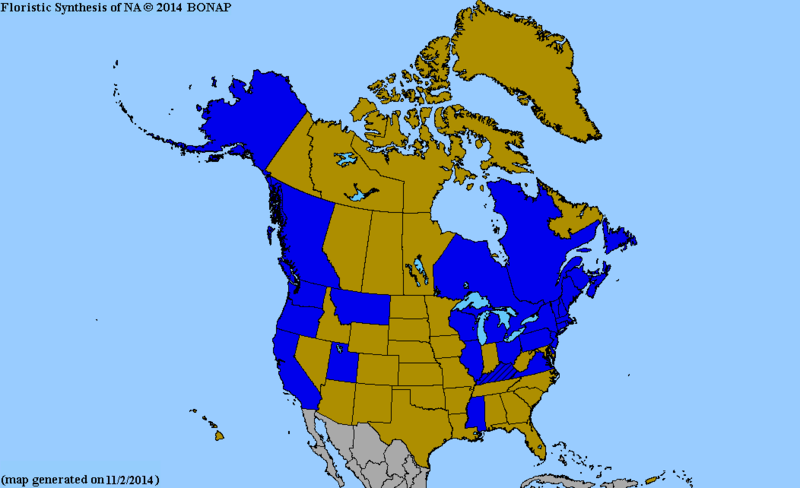 Biota of North America Program (BONAP) distribution map of all the different Hawthorns known in North America here. BONAP map color key here. List of species of Hawthorn here. List of Yellow fruit Hawthorn here. List of Black fruit Hawthorn here. Common Hawthorn (Crataegus monogyna). Known also as the "One Seed Hawthorn", Single-seeded Hawthorn, Haw, May, Mayblossom, Maythorn, Motherdie, Quickthorn, Whitethorn. 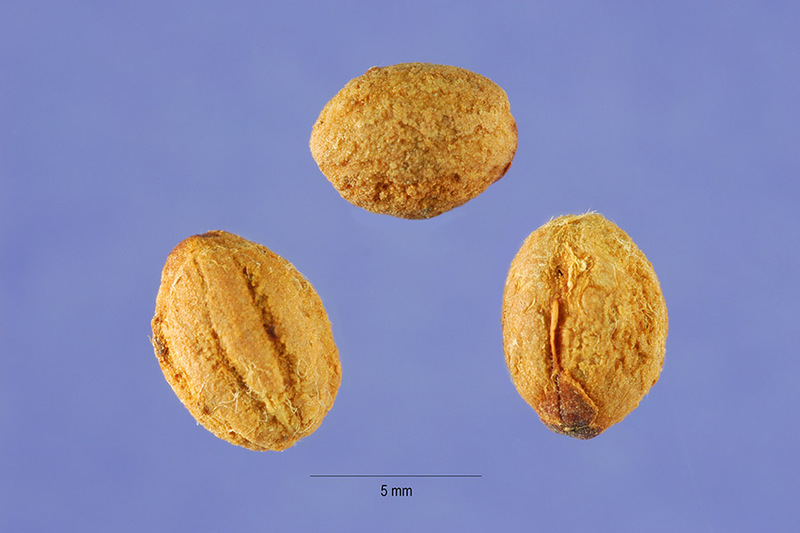 Though a native to Europe, Africa and parts of Asia, it has become naturalized in North America. This is the one that was used most often in Europe in past times for food, and most recipes that you find for Hawthorns (not Mayhaws) are referring to the fruit from this one. It is very commonly found in North America, and has been labelled an invasive weed in many places. I know that the name, "Common Hawthorn" is a good one for where I live in Southwestern Ontario. In the alkaline soils in soy and corn farm country here, I have seen this one literally take over and fill abandoned farm fields, or where cattle grazes but the farmers do not cut the grass in their fields. North of London years ago I saw an abandoned farm field (I would guess that was 100 acres) that was a solid mass of full sized Common Hawthorn. This is the Hawthorn that is used medicinally most often. USDA Plant Hardiness Zone: 4-11 (More information on hardiness zones). Leaf Shape: Very deeply lobed (sometimes right to the central vein), 3-5 lobes per leaf, a rounded triangular shape wider at base. Flowers: 1 cm (2/5 inch) diameter 5 white petalled flowers with many red stamens in the center in a corymb of 5-25 flowers. Flowers are fragrant. Fruit: 1 cm diameter red pome. Habitat: Adapts to most environments, seems to quite like slightly alkaline soils, full sun. Tends to invade waste areas, grazing fields, along fence lines, edge of forests and fields. Does well on clay soils. English hawthorn (Crataegus laevigata). Also known as the Midland Hawthorn, Woodland Hawthorn and Mayflower. Very similar to the Common Hawthorn described above. Use the fruit of this one just like the Common Hawthorn. Fort Sheridan Hawthorn (Crataegus apiomorpha). Hawthorn thorns can do a lot of damage to people and pets. If you grow this tree, prune the thorns with pruners or wire cutters. They will not grow back. This is what they usually look like in overgrown fields. For identifying the different Hawthorns, leaf shape and fruit color is the best place to start. Be aware, there is a huge range of Hawthorns you are likely to encounter. This was a yellow fruit variety. Picture taken late in the fall.